It took a long time for humans to prove that the world is round. Anyone pre-16th Century bold enough to make that claim was labeled heretic, excommunicated, placed under house arrest, or killed. Fast forward a few centuries, from Galileo to Google, and as Thomas Friedman indicated with the title of his book, “The World is Flat,” well, the world, thanks to technology, is flat again. It’s no great revelation that the Internet has led to incredible change, flattening the world and allowing for tremendous opportunities. But it’s also transformed in-person networking into something as alien as life on Mars. Many bloggers and online entrepreneurs get their start by conducting research on the Web, chatting in online forums, scouring the Internet for competitors and a niche. And many have launched businesses without ever meeting, in person, one individual from their field. But the lost art of face-to-face communication is crucial if you’re looking to take your blog or business to that next level. In an interview, Tim Ferris, author of the 4-Hour Work Week, said, “I chose the least crowded channel… to connect with people who are thought leaders.” That least crowded channel was events like South by Southwest Interactive and BlogWorld Expo. Instead of hard-selling his book, Ferris used his time to discuss his idea, but more importantly to ask attendees, “Is there anyone else at the conference that you think I should meet?” When he was pointed to the right people, interest in his book developed naturally and these individuals became the future champions of his other successful projects. Who knows if Tim Ferris would have been as successful if he had only made his connections on the Flat World Wide Web? 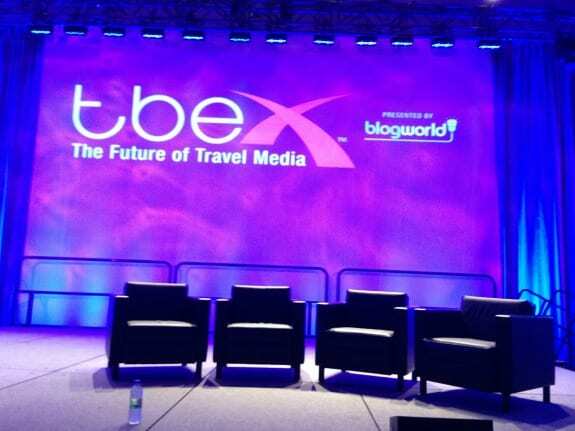 At the end of 2012, a few months after I started my travel blog, Somewhere Or Bust, Twitter started chirping the acronym #TBEX. It was the first time I had ever heard of the world’s largest travel blogging conference. Though I would be unable to attend the gathering in Spain, Twitter once more informed me that a few travel bloggers would be hosting mini-TBEXes in cities around the world. I live in New York and, needless to say, my city was on the list. “I’m looking for a bunch of travel bloggers,” I said to the bouncer, who filled up most of the entryway into the bar, where New York’s mini-TBEX had been scheduled. “Are there travel bloggers here?” I said to the girl guarding the door to the private party upstairs. “This is for Doug,” she said, rolling her eyes. Before giving up, I asked the bartender. “I think those six girls are travel bloggers.” The bartender walked me over to the table and introduced me to half dozen ladies. But I needed more. I needed less Facebook and more face-time. I wanted to meet at least a baker’s dozen of travel bloggers because I had myriad questions, most of which I had previously hurled into Cyberspace where they remained floating unanswered like orbital debris. I wanted to chat with representatives from destinations and travel companies to discuss collaboration or potential partnership because my prior online introductions were sitting in their inboxes (or sucked into that black hole shaped like a trashcan). My next big idea – an ebook, a podcast, or a blogger campaign – looked like an unreachable galaxy because I remained stuck wasting time trying to determine how best to proceed and who to enlist from that overwhelming pool of unidentifiable online assistants. And while my mini-TBEX experience was worthwhile, I was blown into orbit (which actually wouldn’t work as well on a flat earth) when I went to Toronto for TBEX. The conference allowed me to engage with speakers, troubleshoot with experts, pitch to bloggers, determine potential collaborators, eavesdrop on dreamers. The face-time shifted everything from anonymous to real. Ninety percent of the emails I sent after the conference received immediate responses. At TBEX, PR reps related to me because I had bowled (at an after-party) as poorly as they had. To one DMO representative, I’m the guy he might remember that next time he sits down for foie gras and ice cider because we had an intense conversation about the pairing. I even discovered bloggers who I will reach out to when I take that plunge – Scratch that – when I sail off, over the horizon, to collaborate on that next big idea. Plan in advance. I purchased an early bird ticket and probably got my money’s worth in the food and coffee alone. Identify the speakers and attendees that you want to meet. Come with questions and know what you can offer them. Don’t just think in the present. Consider where you want to take your blog and/or business, and link up with attendees who seem like they can become future partners, collaborators, or promoters for your upcoming projects. Be sociable. If this doesn’t come naturally, attend meet-ups or events to practice. Lunch is a great time to chat. Attend as many events as possible. Even if you make one worthwhile connection at each event, between conferences, lunches, parties, after-parties, and the lobby, you’re going to walk away with some solid contacts. Author bio: Noah Lederman writes the travel blog Somewhere Or Bust. His travel writing has appeared in the Boston Globe, the Chicago Sun-Times, Islands Magazine, the Economist, and elsewhere. Visit his blog to get your free copy of his humorous travel ebook, Misadventures in Southeast Asia. You can also follow his (mis)adventures on Twitter, Facebook, Instagram, and Google+. Great article Noah. A good reminder to keep an open mind and to come prepared. Looking forward to meeting you in Dublin.